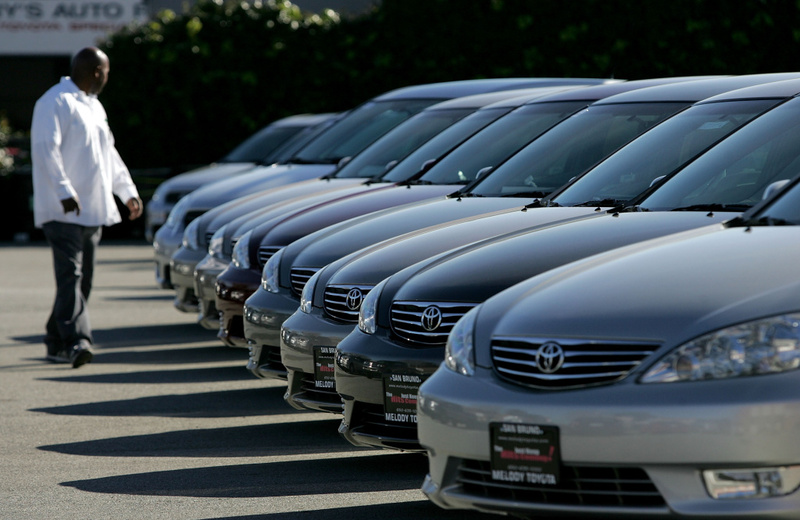 A man inspects new Toyota cars on display at Melody Toyota in San Bruno, California. A bill has been passed requiring newly purchased vehicles to have temporary license plates. The bill, AB 516, which was proposed by Democratic Assemblyman Kevin Mullin of South San Francisco, would be put into effect by 2019. The law currently requires the DMV to issue 2 license plates to car owners and dealer must attach a report of sale form to the vehicle. This leaves room for untraceable tickets and other violations. But what does this mean for consumers? Dealers and lesser retailers will electronically report the sale to the DMV and give new car owners the temporary license plates. Questions still remain about how people having problems with DMV registration would be able to drive off the lot with a new car. Patt Morrison speaks to The Ride host Sue Carpenter today for everything you need to know about the bill. As another Republican, California billionaire jumps ship for Clinton, what voting tradeoffs are you making? Did the US pay $400 M in ransom to Iran?